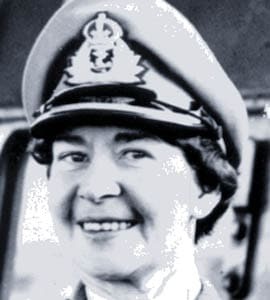 Principal Matron Christina McDonald joined the Royal New Zealand Nursing Corp in 1943 and was immediately seconded to the ‘new’ Royal New Zealand Navy Hospital (RNZNH) at Devonport, where she became Sister In Charge. In the transcript she talks at length of the problems of acquiring clothing, material and equipment needed by a fully functioning hospital. In 1946 McDonald reverted back to the army and managed a hospital in Japan for the occupying J Force. She remained there until 1949 when she returned to New Zealand and subsequently to the Royal New Zealand Navy Hospital to assume the position of matron at the hospital that she had been instrumental in setting up a few years prior. Christina McDonald left the hospital in 1956 and became Principal Matron of the Royal New Zealand Nursing Corp, where she remained until she retired in 1958.